This was a truly random recipe choice. I counted along my cook books, from left to right, until I reached the magic number 30. The title I landed upon was a tiny little book crammed in between a couple of heavy weights, The Silver Spoon and How to be a Domestic Goddess. My random book was GoodFood: 101 Cheap Eats; not the most exciting or inspiring perhaps of all the books on my shelf, but there you go. That’s the point I guess when it comes to picking a random recipe. The next direction was to turn to page 30, which I dutifully did. And the recipe in question was for Bacon Kebabs on Mushroom Rice. Not bad, I thought, although my daughter Jessie won’t be thrilled. The face she pulls if you suggest she eats a mushroom couldn’t be worse if you’d suggested she eat something you’d discovered on the bottom of your shoe. So why the random recipe choice? Many of you will no doubt already be familiar with Dom at Belleau Kitchen’s Random Recipe challenge, which this month celebrates the big three-oh. I thought it was about time I entered a dish. I’ve meaning to so for about the last year. All too often I’ve got as far as selecting my random recipe and then completely forgetting to make it before I realise the deadline has already been and gone. The story of my life really! But this month I’ve done it. Only just mind – July’s challenge closes in just over an hour. If I type quickly, I think I’ll just make it! While the Bacon Kebabs might not have been the classiest or most challenging of dishes, they did give us a good plate of decent grub which went down very well with all the family – with certain members avoiding coming into close proximity with anything remotely resembling a fungus, obviously. It’s not a recipe I’d necessarily have picked out myself to make, but it’s a simple one I can see myself doing time and time again, and one I might possibly prepare the night before for a lazy Sunday brunch when we’ve got people staying the weekend. Blanch the leeks in boiling water for 4 minutes. Cut the remaining mushrooms into quarters. Stretch out the bacon with the back of a knife and wrap around each piece of leek, mushroom and sausage. Carefully thread onto skewers. I made sure, of course, that a few of the skewers were free of the “evil” mushroom. Melt half the butter with half the dried thyme and lemon juice, and then brush over the kebabs. Grill under a high heat for around 15 to 20 minutes, turning regularly until cooked. Melt the rest of the butter in a pan and cooked the chopped mushroom (or in my case, chopped aubergine) with the remaining thyme until softened. Add the creme fraiche, season and stir well. Drain the rice and stir into the sauce. Stir the kebab pan juices into the rice and serve immediately. 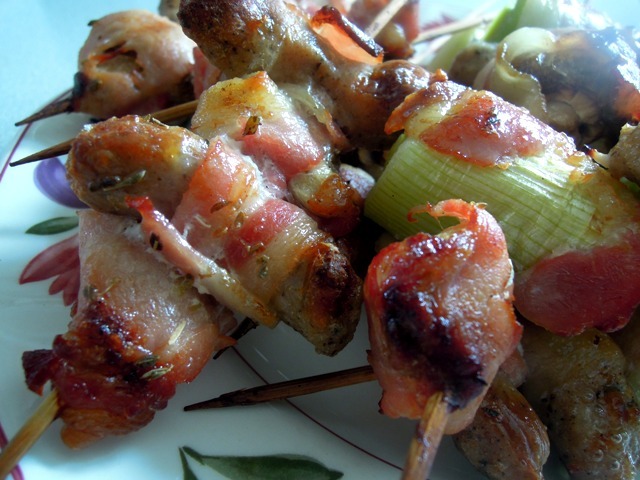 And as this is such a cheap and cheerful dish, I’m also entering these yummy Bacon Kebabs into July’s Credit Crunch Munch from Fuss Free Flavours and Fab Food 4 All, which is being brilliantly hosted this month by Sian at Fishfingers For Tea. What a delicious recipe. Love leeks and bacon. Thanks! Yes leek and bacon are a bit of a match made in heaven, aren’t they? Thanks so much Dom! I don’t know where July disappeared to! But it’s such a good feeling to have finally entered Random Recipes – it’s such a brilliant challenge and a great way to try out new dishes. Great recipe. 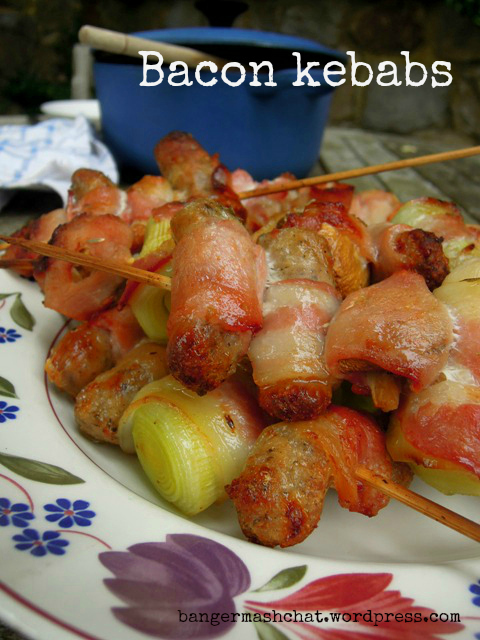 I’d never have thought of using bacon on kebabs. Nor me. But it works very well. I’d love this for brunch. 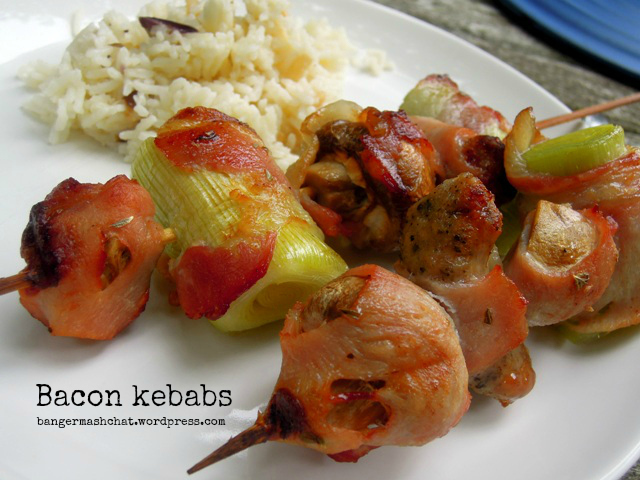 Random Recipes can turn up some unusual treats sometimes.and bacon on a kebab sounds unusual but delicious at the same time. As a kid I think I saved up some strange, horrified expressions for the threat of mushrooms but I grew out of it eventually. These look fab – I think I have that book too – I’ll have to dig it out! Those look great, easy eating and I bet kids would love them. Thanks Janice – yes, they did go down exceptionally well with my kids!